Proposals for a Sheffield-Rotherham Advanced Manufacturing Innovation District (AMID) have won an award that explores the opportunities of city devolution. And the cash prize is being used to help young people from the Sheffield City Region get the chance to secure employment. A submission based on the idea of developing Europe's largest research-led advanced manufacturing cluster to the Lambert Smith Hampton Enterprise Award has been successful, highlighting how the property industry can play a central role in shaping the future of the UK. The award, which has a total prize fund of £15,000, was judged by a panel of leading experts from across the industry. Advanced Manufacturing Park (AMP) developers Harworth Estates and Sheffield Business Park submitted the entry and have announced they will match the prize money to create a £30,000 fund to enable local young people that aren't in education, employment or training, to get apprenticeships with local advanced manufacturers and a place at the AMRC Training Centre. Iain Thomson, partnerships manager at Harworth Estates, said: "Using the prize money for this purpose made complete sense. Developing future talent is the only way we'll achieve sustainable economic growth for the region and the AMRC is a world-leading institution in making this happen." 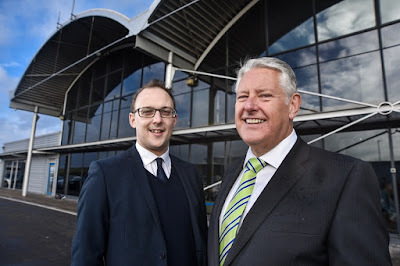 Graham Sadler, managing director at Sheffield Business Park that is being delivered in joint venture with Peel Land & Property, said: "It is incredibly important that we have sufficient people from this region with the right skills to take jobs in growing sectors. The AMRC Training Centre has built up an enviable record for enabling young people to gain those skills, so it was the natural choice to make the best out of our award success." The entry explained how devolution would be used to support the growth of advanced manufacturing in the region and how others from across the UK could apply similar principles to grow other high-value industries elsewhere. Prof. Keith Ridgway CBE, executive dean at the AMRC, said: "Their decision to use the prize money and then match it with their own contribution to help young people to get jobs and learn advanced manufacturing skills recognises how important creating a new generation of talented youngsters is to the success of the Advanced Manufacturing Innovation District and the contribution it can make to the economy of the region and the UK. He also praised the award-winning entry's calls for greater collaboration between property specialists and universities to develop sites that boost UK competitiveness by encouraging knowledge transfer. "That is exactly what is already happening on the Advanced Manufacturing Park and Sheffield Business Park and will be one of the foundations of success of the Advanced Manufacturing Innovation District," said Prof Ridgway. Based on the Advanced Manufacturing Park (AMP) in Rotherham, The AMRC Training Centre forms part of the University of Sheffield's Advanced Manufacturing Research Centre (AMRC) group and provides training in the practical and academic skills that manufacturing companies need to compete globally, from apprenticeship through to doctorate and MBA level. Kerry Featherstone, head of operations at the AMRC Training Centre, said: "We are already training 20 apprentices working for SMEs whose salaries are supported by Close Brothers, the merchant bank, as part of a programme to fuel SME expansion by recruiting the best young talent. "We have also worked with the Prince's Trust and Boeing on a programme aimed at young people aged 16 to 25 who are not in education, training or employment and designed to give them a flavour of what it takes to be an apprentice and embark on a rewarding career in manufacturing. "We will use the same principles to make the most of this generous gift resulting from the award-winning success Haworth Estates and Sheffield Business Park secured on behalf of the AMID."